Home > SSP > South Side Performance Introduces the World's first Intake Manifold for the Nissan R35 GT-R.
South Side Performance Introduces the World's first Intake Manifold for the Nissan R35 GT-R.
Sioux Falls, South Dakota (January 21, 2009) – South Side Performance is offering, another world’s first for the R35 GTR, the SSP 820RS intake manifold. This component is just the first in a line of SSP products that will move power hungry GTR owners towards 820 HP, when paired with our recently released GTR820RR Turbo Kit. The intake design is the result of months of testing a wide variety of shapes and designs before finding a design that would make big power, and still be pleasing to the eye. 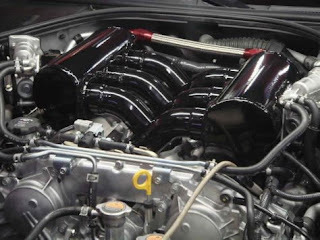 As with nearly all SSP products, the intake utilizes stock lines, and is designed to utilize perfect stock style fitment of all under hood accessories. 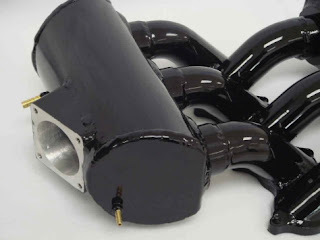 But, this intake is more than just a pretty face, as its main purpose is to provide the lung capacity to make major power. With just simple bolt ons, this intake has been proven to make 15 whp and 28 Ft lbs of torque on stock turbos. 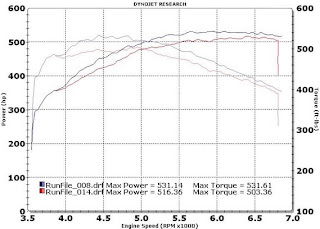 These power gains are linear and constant all the way to redline, as the intake feeds an ever increasing supply of air to the GTR’s fire breathing 3.8L V6 (SEE DYNO GRAPH FOR DETAILS). 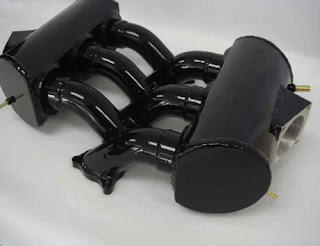 The 820RS Intake manifold’s design utilizes time tested racing technologies to make its power. 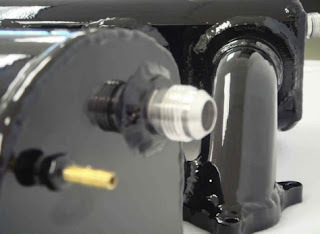 The manifold incorporates 5 in extruded D-Plenum technology, 2 ¼ in velocity stacks, and 45 degree intake runners that utilize a straight shot for air into the intake. The openings are machined 60mm openings for fitment of the stock throttle bodies, but the intake also incorporates some room to grow should you want to later upgrade to larger throttle bodies down the line. The result of all this technology is an intake that has over 2 times the air volume capacity over stock and is also lighter than the unit it replaces. No need for your plastic intake cover as this intake is sure to draw they eye in either raw machined aluminum or a gloss black powder coat.